Fresh out of the mould in late 2005, Jeanne is a spacious Bavaria 42 Cruiser with three double cabins, making her ideal for sailing in comfort with a crew of six. Details of the layout can be viewed below, but to summarise consists of: two large aft double cabins; on the port side is the aft heads which also contains the shower, and the navigation station lies opposite. Forward of the saloon is a large double cabin which serves as the Master Cabin, with the second heads and wash basin ensuite to this. 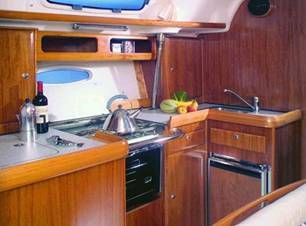 Her well equipped galley has a three-burner stove with oven, complimented by a large refrigerated ice box and a separate fridge. The saloon is spacious and light, with a couple of deck hatches helping to shed light on matters. As with all of our boats she is equipped with warm air cabin heating. Equipment wise Jeanne benefits from an electric anchor windlass and bowthruster, whilst the autopilot and chartplotters make life comfortable for those at the helm or nav station respectively. She has full ST60 instrumentation, together with back-up NAVTEX. The cockpit plotter has radar overlay, whilst the unit at the chart table serves as a useful backup and can be used for setting an overnight anchor watch. Her fully battened mainsail has three reefs (first two on single line systems) and a furling genoa. For days when the wind is not blowing she has a powerful 55hp Volvo saildrive engine which is easily able to push her along at between 7 and 8 knots. Like all our boats Jeanne comes with complimentary tender and outboard, and is fully coded to MCA requirements. This means that she has a full compliment of safety equipment on board, including lifejackets and harnesses, liferaft, flares and first aid kits, as well as a range of automatic and manual fire extinguishers. She is also equipped with a large folio of Admiralty charts, pilots and almanac, together with an on-board manual and supporting literature.